A day before Jay's engagement we had a small gathering at home where the ladies got mehendi (henna) put on their hands. We had some traditional songs and dances and finished with delicious food! 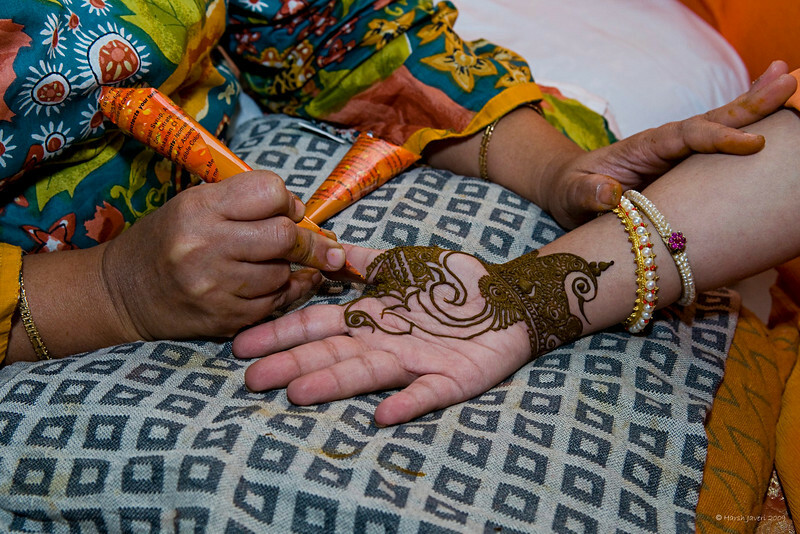 This shot shows a lady applying mehendi paste on daughter Vinati's hand. The paste is put in a conical tube with a pointed tip from where the deisgns are 'painted' on hands. Very interesting! requires a lot of patience I assume. Very Interesting, Great series of pictures. Very interesting and artistic! Lovely shot! Very beautiful and interesting shot! This is such a great image! The detail in the "mehendi" is incredible, truly a work of art!